Use different patent search services with varying coverage. Connect to multiple services for pdf-, image-, bibliographic data and fulltext acquisition. User interface. Based on contemporary web technologies and responsive design, it works on multiple devices. Use it on PCs, tablets, smartphone devices or as a multi-screen solution. The clear and well-arranged design and layout permits efficient screening of large numbers of patent documents. Dossier management. Manage different collections of patent documents and apply ratings and comments. REST API. Through the extensive REST API, all functionality is available to 3rd-party systems. Deep integration has no limits. Sharing. Well-designed collaboration features allow efficient sharing of information with your colleagues and partners, even across the boundaries of in-house systems. Multitenancy. The software can operate on behalf of different vendors. It’s easy to apply custom branding. … against EPO/OPS and display the results. You will be able to step through result pages and display fulltext- and family-information, but running custom queries will be disabled. The numberlist demo will display the patent documents DE102011075997A1, DE102011076020A1, DE102011076022A1 and DE102011076035A1. This is a showcase about how to integrate a link to a list of patent documents into own applications. 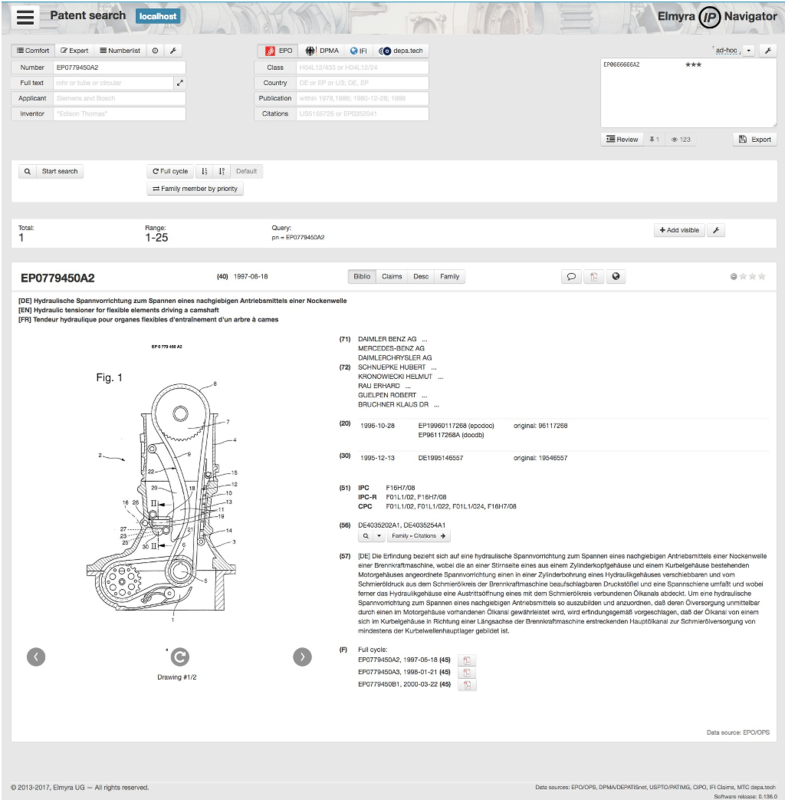 The document view demo will display the patent document EP0666666A2 without any control elements. This is a showcase about how to embed the document view into own applications or how to directly link to single documents. The nasa-public-domain demo displays the latest NASA patents put under the public domain. The IP Navigator uses different API services for accessing patent information. Getting started with the software or deploying it yourself is quite easy if you are familiar with Python. We will only cover development here, see the install documentation page about how to install, configure and run an instance. The software should work on any other Linux or BSD distribution, but this is beyond the scope of the README. It runs on Python 2.7, but is not ready for Python 3.6 yet. Contributions are welcome! The software got some applause from professional researchers for its unique user interface and rich feature set when it was released to the first audience in 2014. We hear from our users they are still having a great pleasure working with it on a daily basis. After four years of development, the source code finally gets released under an open source license in 2017. We are looking forward to opening up the development process as well, every kind of participation and support is very much welcome. We are always happy to receive code contributions, ideas, suggestions and problem reports from the community. Spend some time taking a look around, locate a bug, design issue or spelling mistake and then send us a pull request or create an issue.